Boro took a 24th-minute lead through Spanish centre-half Daniel Ayala – and admittedly deserved their win for all their play thereafter. 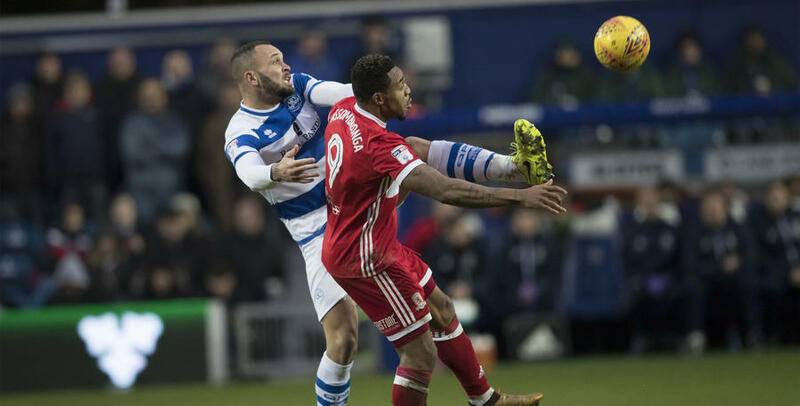 George Friend’s 35th-minute blockbuster gave the visitors a 2-0 half-time lead and, as QPR continued to struggle to carve out clear-cut opportunities following the interval, the impressive Adama Traore struck in the 85th minute to seal victory for Tony Pulis’ charges. After seeing his side record back-to-back Championship wins, R’s boss Ian Holloway named an unchanged starting XI following our 3-1 triumph at Burton last weekend. That meant that once again, in a 3-5-2 formation, Rangers lined up as: Alex Smithies; Nedum Onuoha (captain), Joel Lynch, Jack Robinson; Darnell Furlong, Josh Scowen, Massimo Luongo, Luke Freeman, Jake Bidwell; Conor Washington, Aramide Oteh. The Hoops started brightly enough, and fashioned the first attempt of the contest in the sixth minute. Defender Robinson went mightily close. His shot from fully 30 yards crashed into the right-hand stanchion behind the goal. The opening 20 minutes made for a relatively-tight if drab affair, with Traore’s 25-yard effort for Boro – that flew well wide of the target – the only other of note inside that period. But the visitors took the lead in the 24th minute. In truth, Rangers will probably be disappointed with how the goal materialised, with Boro gifted two free headers to score from a left-flank corner. Ben Gibson headed on Grant Leadbitter’s delivery at the near post, before Ayala stole in round the back to nod home from all of a yard out. That goal only served to buoy Boro, who took great confidence from their opener. Indeed, Pulis’ men began to look more and more dangerous with every attack and, in the 35th minute, gave themselves a two-goal lead going into the interval. Friend’s 35-yard thunderbolt really was a goal-of-the-season contender, with the ball arrowing past Smithies and into the top left-hand corner of the net. Rangers now had it all to do, but Robinson’s precise long-range pass over the top of the Boro defence almost enabled Washington to pull a goal back for the hosts on the stroke of half-time. However, on the stretch, the striker could only direct a tame effort at Darren Randolph in the Middlesbrough goal. Two goals behind, Holloway opted for a double substitution for the R’s going into the second half. Bright Osayi-Samuel and Matt Smith were both introduced, with Bidwell and Oteh making way. Rangers did improve after the break, with Onuoha and Washington shooting wide from distance, but they still lacked a cutting edge when the hour mark arrived. Boro then threatened a third goal in the 61st minute. Britt Assombalonga teed up Downing on 12 yards, whose subsequent goal-bound blast forced an important block from Furlong. A minute later, QPR also went close. Luongo’s drive from range flew just inches past the upright. Rangers should have pulled a goal back in the 68th minute. Freeman’s left-wing corner picked out an unmarked Smith, but he could only head over from eight-yards out. The R’s used their third and final sub with 20 minutes remaining. Ebere Eze replaced Scowen. However, it was the visitors who were then almost on the scoresheet again. Boro broke before sub Rudy Gestede slid past Smithies from 12 yards. Though Robinson intervened to clear off the goal-line. As Rangers continued to search for a way back into the contest, play began to switch from end to end and, in the 82nd minute, Lynch’s close-range effort was held well by Randolph. Seconds later, it was the turn of Smithies to make a smart save. The goalkeeper flung himself to his left to turn the ball away, after Gestede met Traore’s centre. Five minutes from time, Robinson spurned another decent home opportunity, heading over when free on six yards. And Boro finally put the result beyond doubt soon after. Traore skipped in behind the Rangers defence and, as Smithies raced out of his goal to challenge him, the winger crisply tucked the ball under the 'keeper to rubber-stamp his team’s victory. 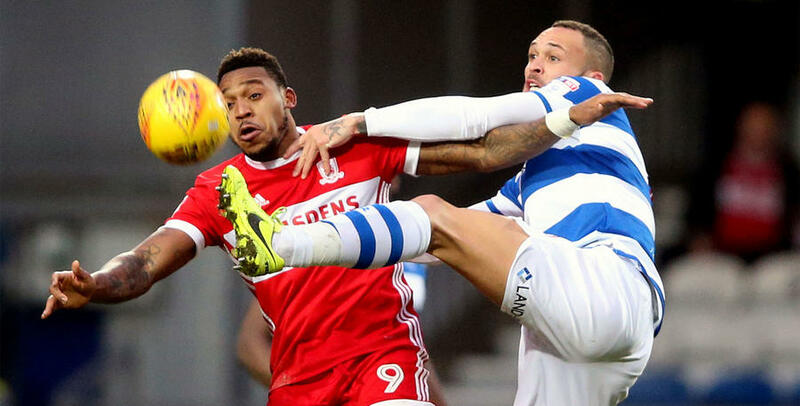 WATCH back highlights from QPR's disappointing 3-0 defeat against Middlesbrough.